1. Peel and thinly slice the onions. Peel and grate the carrot. Chop the green chili. Take curd in a bowl, add little salt and whisk it well until smooth. 2. Add the sliced onions, grated carrot, chili, coriander leaves, sugar and salt to a mixing bowl and mix well. Now add the whisked curd and mix it well. 3. 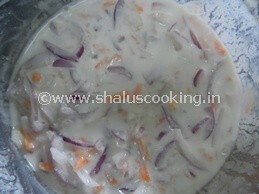 Easy Onion Carrot Raita is ready to serve.